Jack Stewart,'50 Oldsmobile. While most other shops were adopting a flamboyant gingerbread style at least partially promoted by car show competition in the '50s, Valley Custom retained a less-is-more attitude that relied on skilled, usually complicated metalwork rather than paddled-on lead or bolted-on chrome. 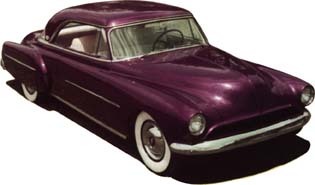 The four inch sectioned, "Orchid Flame" painted, Polynesian Olds, completed in '53, was their best example of '50s styling. Built while serviceman Stewart was stationed in California, he took it home to Toledo, Ohio, where it was later modified with rear fender fins of some sort, and is reportedly stored at a shop called the Red Lacquer Room, awaiting restoration. Need an update on this car.